There are two collections of new homes in Las Vegas, NV that feature two story design. The Coronado contains three floor plans: The Barcelona contains six floor plans: and the Balboa Collection contains four new floor plans. The prices start from the high $400,000s. The ten model estate homes feature up to four bedrooms and range from 2,320 to 3,495 square feet. The collections feature side and front porches, balconies and courtyards. The townhomes in the Casa Citta Collection are priced from the mid $500,000s. The townhomes for sale range from 2,736 to 2,817 square feet. The Casa Citta townhomes have three or four bedrooms in a three story design. The homes offer master retreats, island kitchens, and bonus rooms on the first floor. The Castellos Collection of mansion homes in Las Vegas Nevada real estate. Each mansion includes four condominiums. The Inspirada homes for sale are priced from the mid $300,000s. The two story units feature up to three bedrooms, balconies and lofts, master bedrooms with a separate shower and tub. The Castellos Collection homes range from 1,406 to 1,715 square feet. The seven villages in Inspirada will be in close proximity to a community center and a central park for residents. Call 702-505-6988 for VIP Las Vegas homes mls search by a Las Vegas real estate agent. 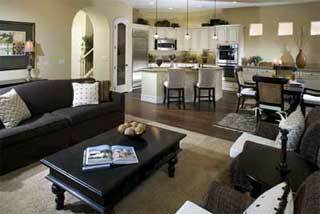 Inspirada Las Vegas offers new Toll Brothers homes within master plan.